The system reserve margin in the UK power market is at an unprecedented level of tightness coming into the second capacity market auction in December. Yet a low capacity price outcome is likely to cause the closure of more existing capacity and inhibit the delivery of new capacity. The system reserve margin in the UK power market is at an unprecedented level of tightness coming into the second capacity market auction in December. Last year’s inaugural capacity auction delivered little in the way of new capacity. In fact the low auction clearing price (19.40 £/kW) crystallised the economics of a number of older thermal plants which have since indicated they will close. So whatever the outcome of the 2nd capacity auction next month, the system reserve margin is set to tighten further into winter 2016. If you had no knowledge of the UK power market and somebody explained this landscape to you, what would you anticipate would be happening in the capacity market? You would probably assume that prices would clear at a level that prevented the further closure of existing plants. You may even expect a capacity price that incentivised the delivery of large scale new capacity build. Our take on the second capacity auction is that neither of these things are going to happen. The 2nd auction is for delivery of capacity over the Q4 2019 to Q3 2020 period. As for any market, the auction outcome is driven by the interaction of supply and demand. Demand is determined by the government’s capacity target. Supply is driven by a prequalification process where different sources of capacity are accepted into the auction subject to a defined set of conditions. A firm view on the volume and type of prequalified capacity only became available two weeks ago. So with this in hand we now have all the information required to undertake a robust analysis of the 2nd auction outcome. As for last year, the information in this article is a higher level summary of more detailed analysis that we have undertaken of auction drivers and pricing dynamics. Detailed projections of the 2nd auction pricing dynamics and implications for the UK power market are available in our client briefing (details below). The 19.40 £/kW capacity price in the 1st auction last year was well below the market consensus view (around 45 £/kW). This outcome was driven by an oversupply of existing capacity relative to the government’s demand target. These conditions remain in the second auction. The government’s demand target is 44.6 GW this year, with a similar demand curve structure to last year where demand varies depending on clearing price. Demand increases by up to 1.5 GW above the target at zero price, or decreases by up to 1.5 GW below the target at the 75 £/kW price cap. The demand curve can be seen in Chart 2 below. On the supply side, there is around 50GW of existing capacity (including capacity that is already committed and under construction). So the market is oversupplied again this year and this will again act to supress prices, in the absence of a material shift in the bidding behaviour of existing plant owners. An overview of the supply and demand balance is shown in Chart 1 which breaks down supply by capacity type. What’s new in this year’s auction? If you are not particularly interested in the drivers of capacity pricing and just want a view on market outcome then you can skip to the next section. In this section we focus on five important factors that change the competitive landscape in the 2nd auction. There are also a number of more technical rule changes that have been implemented into the second auction. These are not dealt with in this article. Interconnectors: This year’s auction has an additional 2.4 GW of de-rated interconnector capacity that was not eligible to participate last year. Interconnectors have been included in the auction on the basis of quite steep capacity derating factors to reflect flow uncertainty. But both existing and new interconnectors will likely be bid at zero price, given healthy energy margins (driven by higher UK power prices vs those on the Continent) and other regulatory support (e.g. the cap & floor revenue structure). In other words inclusion of interconnectors will act to displace existing capacity. Supply reduction: 7.6 GW of existing capacity has opted out of the 2nd auction. 5.8 GW of this capacity has opted out because owners have indicated an intention to close plants by the delivery year (2019/20). In addition there is 3 GW of capacity from last year’s auction that will not participate this year given it received 3 year refurbishing agreements (EDFs Cottam and West Burton coal units). The removal of these plants from the auction has significantly reduced the number of older thermal plants from the capacity supply stack. This makes analysis of this year’s auction somewhat easier. New build penalties: Only one new CCGT was successful in last year’s auction. We have written about the problems encountered by Carlton Power’s Trafford CCGT project. As a result of the issues with the Trafford project, the government has introduced a range of stronger penalties for owners which fail to meet their capacity obligations. 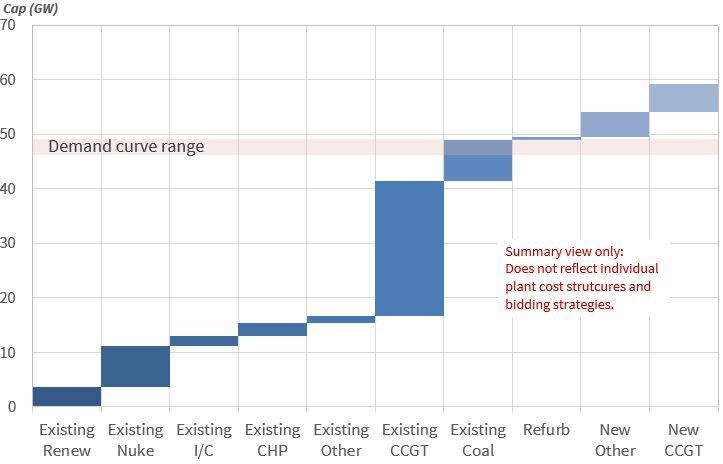 In practice this means that new build CCGT projects are likely to bid at higher price levels than in last year’s auction. 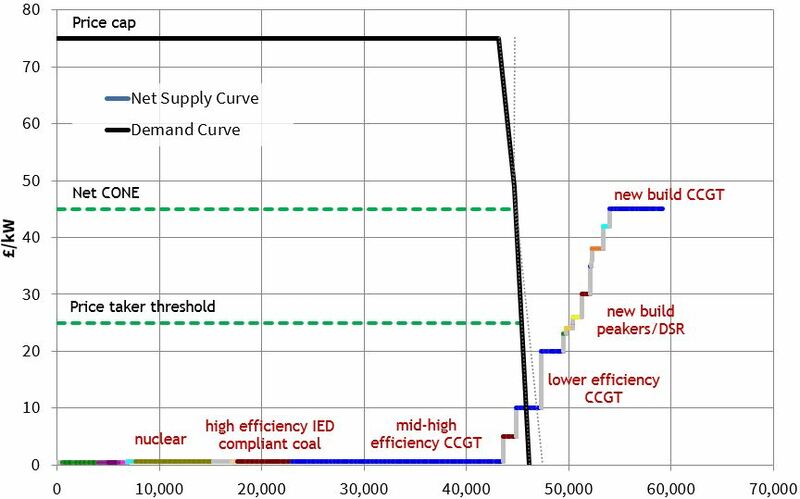 In fact in an oversupplied market, we would be very surprised to see any new build CCGT project successful in the 2nd auction, aside from the 810 MW Carrington CCGT project which is already under construction and is therefore capacity price insensitive. Forward market energy margin conditions for CCGT plants are broadly similar to those going into last year’s auction (suggesting that CCGT bidding behaviour may be similar). Forward energy margin conditions for coal plants have deteriorated as dark spreads have declined with falling power prices in 2015 (suggesting that coal plant owners may bid at relatively higher levels than last year). Marginal bidding: The other dynamic demonstrated by last year’s auction outcome is that unless owners are prepared to close their plant if their bid is unsuccessful, they are strongly incentivised to bid zero. In other words capacity bids are likely to reflect the true incremental return required to keep assets open. This dynamic is important coming into the second auction because it appears to us that the volume of capacity that is likely to bid at (or close to) zero price comes close to meeting the government’s demand target. The five factors above combine to play an important role in driving the dynamics of the second auction outcome. These dynamics remain relevant into the 2nd auction but with greater pressure on prices. In order to provide an overview of 2nd auction pricing dynamics we start with a supply and demand chart. It is important to note that Chart 2 does not represent our projection of the auction outcome (as was inferred by several readers when we published a similar chart last year). This is reserved for our client briefing. Instead it shows a credible scenario based on groupings of assets into categories. Our modelling framework allows the analysis of pricing dynamics at an individual asset level. But for the purposes of this, we consider market dynamics based on the grouping of plants of similar technology, age and efficiency. This helps in demonstrating the key drivers of marginal pricing dynamics. The first observation from Chart 2 is that there is a large volume of ‘price insensitive’ capacity bidding around zero price. This is made up of existing capacity that owners do not intend to close by 2019/20, regardless of capacity price outcome. For example, it includes existing hydro, nuclear, interconnectors, peakers/DSR, higher efficiency coal and mid to high efficiency CCGTs. It also includes new interconnectors, the 810 MW Carrington CCGT (under construction) and around 500 MW of small scale new build peakers and DSR (assumed to be economic based on other revenue streams e.g. ancillaries & triad avoidance revenue). In the scenario shown, this capacity makes up around 43 GW of the 44.6 GW target. That does not leave much room for a high capacity price outcome. It is likely to be the plants sitting directly to the right of this price insensitive tranche in the supply stack that determine the outcome of the 2nd auction. Like last year these are likely to be a mix of lower efficiency coal and CCGT plants, interspersed with more competitive new peaker/DSR projects. But if our assumption of around 43 GW of price insensitive capacity is correct, there may only be a requirement for two or three additional thermal plants to clear the auction. In volume terms a maximum additional capacity of 3 GW would be required to clear the auction, from an overhang of about 7 GW of existing capacity and maybe 1-2 GW of competitively priced new peaking/DSR capacity. It is this level of competition around the margin that is in our view set to supress prices. We think the capacity price is likely to fall within a 0-25 £/kW range. The upper bound of this range is driven by the fixed cost recovery of less efficient CCGTs. There are around 5 GW of these plants competing around the margin and it is our view that a significant portion of this capacity will be priced at or below fixed costs (given capital costs are already paid down). In other words if the auction price rises to the 25 £/kW level there is likely to be more than enough supply to clear the auction. The alternative option to bid capacity into the T-1 auction (in 2018) looks increasingly attractive as existing capacity continues to close in the absence of a new build price signal. The big six utilities have a portfolio consideration where it may make sense to bid marginal assets at positive prices to increase the capacity price return across the rest of the portfolio (even if it means the marginal plant are unsuccessful in securing a capacity agreement). By accepting a capacity agreement in the Dec auction at zero price, owners forfeit the option to close before 2020. That option has some value for marginal older plant and is likely to be reflected in positive bid prices. So while the risks remain to the downside in this auction given the overhang of existing capacity, we would be surprised to see a zero price outcome. Where could we be wrong with the logic set out above? The biggest risk is around the volume of price insensitive capacity we have assumed (e.g. 43 GW in the scenario in Chart 2). If that volume is higher e.g. due to a higher volume of competitive new build peakers/DSR, then it pushes price risk further towards the downside. If the volume is lower, then it reduces the overhang of capacity competing to clear the auction. But we struggle to see a margin of error that absorbs the 5 GW+ overhang of CCGTs and competitively priced new peakers/DSR capacity. If there is another low capacity price outcome in the 2nd auction we would expect a continuation of the fallout from the 1st auction. This may mean the closure of another 2-4 GW of lower efficiency coal and CCGT units (on top of the plant closures already announced). That would leave the UK power market in a precarious state. The chances of rolling blackouts have fallen with the implementation of the Supplementary Balancing Reserve (SBR) mechanism managed by the system operator (National Grid). Contracted SBR capacity acts as a buffer of emergency reserve and Grid will presumably step up the purchase of SBR capacity as the system reserve margin heads towards zero. What is unattractive about this outcome is that SBR risks becoming a proxy capacity market, but one that lacks a robust and transparent rule book. However, SBR capacity (given its emergency status) should not stand in the way of higher and more volatile power prices as plants continue to close. This appears to be the path down which the government is steering the UK power market, whether intentionally or otherwise. And that would provide a rare glimpse of blue sky through the fog of EMR policy intervention. Sharper price signals in the wholesale energy market are exactly what is required to address the impending capacity shortage. We are offering a client briefing service that provides a more detailed analysis of the 2nd auction dynamics, pricing outcome and implications for the wholesale power market and future capacity auctions. This service also includes a conference call to discuss analysis and any specific issues of relevance.